JUNEAU, ALASKA—The Fortress of the Bears, or so the Native Tlingit peoples once called it. A lonely island where brown bears—large, apex predators, known to be aggressive and territorial, roam free. One bear for every square mile, or so we’re told as we approach what is now known as Admiralty Island. Many people might consider this a reasonable excuse to stay as far away from Kootznoowoo as possible, but for many the draw is in just the opposite direction. It’s a popular spot to kayak, camp, hike, and hunt—for both locals and eco-tourists. Today, I’m a bit of both. Working in Juneau for the summer, I’m kind of a local (though I don’t think that’s official until you have a child in the school system), and I’ve chartered a float plane with a few friends to visit Admiralty for the day to observe and photograph brown bears. That’s pretty much the definition of eco-tourism, isn’t it? Now, you might be wondering what a float plane is, so it’s worth it to take a minute and explain. Commercial airlines fly planes with wheels, that land on runways. But this assumes that you have a landing strip, and in Alaska, there are many destinations without such luxuries. 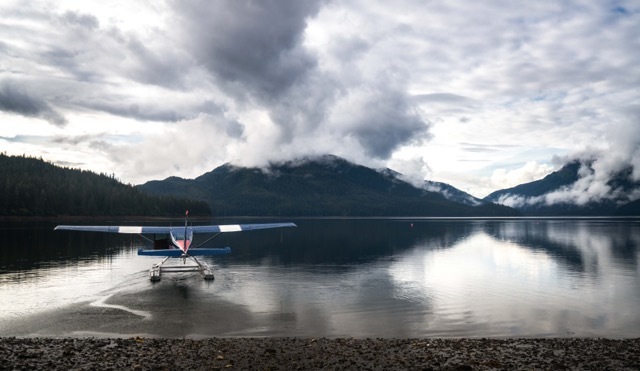 Float planes are designed to land on water, and are especially useful when attempting to reach remote parts of the wilderness without so much as a small beach to eat your lunch on. Consequently, you must jump off the float plane into shallow surf, making disembarking an experience that requires knee-high rubber boots (Xtratuffs works just fine), and a Chinese fire drill of passengers to get your luggage safely out of the plane. As we find ourselves ashore, our pilot, Jacques, quickly dispatches us with a wave and a vague reassurance that he’ll have the office radio the on-duty Forest Service Ranger that we will, in fact, be picked up later that day by one of his co-workers. There is no cell service in the Fortress of the Bears; Jacques is our only way of communicating with the outside world. After a quick survey of our surroundings, we quickly spot a sow (mother brown bear) and a cub a few hundred yards off to our right, quietly digging in the shallows near the waters edge. Covered at high tide and exposed at low tide, the intertidal zone is a prime place for bears to find food such as clams and other shellfish. We think of bears as predators, but they will forage and scavenge their way to a healthy diet the same as us humans. The pair is far enough away that we don’t have to worry about them approaching, but just close enough that we keep an eye on them as we unpack our gear. Today, we are looking for brown bears—distinct from other well-known species such as black bears and polar bears. However, there are sub-species of brown bears—capable of breeding with each other, but prevented from doing so by habitual happenstance. Grizzly bears are a sub-species of brown bear residing in the interior of Alaska; Kodiak bears are a sub-species of brown bear residing on Kodiak Island off the Kenai Peninsula. The brown bears we’ll see today, the ones living near the coast, are known as coastal brown bears. They are larger than grizzly bears, second in size only to the Kodiak. Back in Juneau, I work as a guide. I take people to the Mendenhall Glacier Recreation Area every day, and there is a small boardwalk where we often see bears. It’s an optimal scenario. The platform is raised above the ground, and a small creek runs through it. Black bears with cubs seek refuge from aggressive sub-adult males (who are skittish around humans), and are often seen from this viewing area. Yet after a while, it takes on a zoo-like atmosphere, and there can be hundreds of people looking over a railing at a relatively small black bear who is simply trying to raise her kids and eat dinner. The bears at the Mendenhall Glacier viewing area are wild, but they are heavily habituated to human contact. They are comfortable around us, and have never been known to attack. One of the reasons for this is the Forest Service’s strict management of people around bears: no food, don’t approach them, don’t scare them…simply admire them, and take photographs. Yet to an extent, they seem like spectacles, put their on display for the half-million people that visit the glacier every summer. Tourists expect to be shown grandeur, because they are paying you to give it to them. There is no expectation of uncertainty, but animals are wild and unpredictable. You might lie in wait, but you never know what you are going to experience. At Pack Creek, the experience is a bit different. 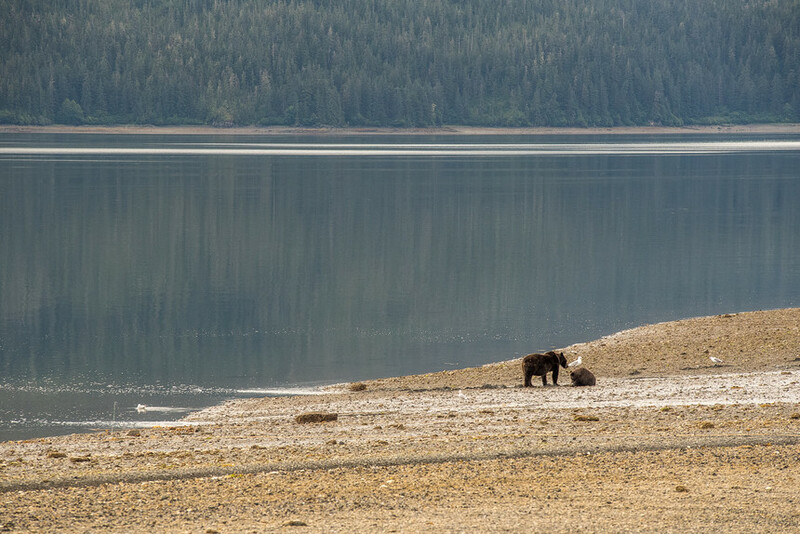 Heavily managed, but lightly trafficked, you are only allowed to be in three small zones for bear viewing: The South Spit, a patch of rocky beach which is best at low tide. 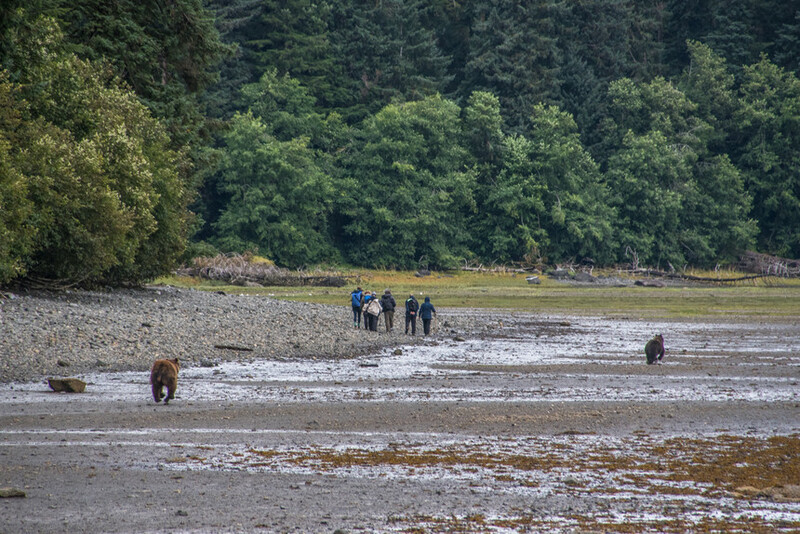 Low tides expose the intertidal zone, and the bears come out from the woods in search of critters that live in the sea. The South Spit, when utilized in conjunction with a lawn chair, makes for a pleasant place to pass a morning, especially when the driving wind and intermittent rain showers are kept at bay. The Viewing Spit is a small clearing overlooking the mouth of Pack Creek itself, where pink salmon swim upstream to spawn and die. 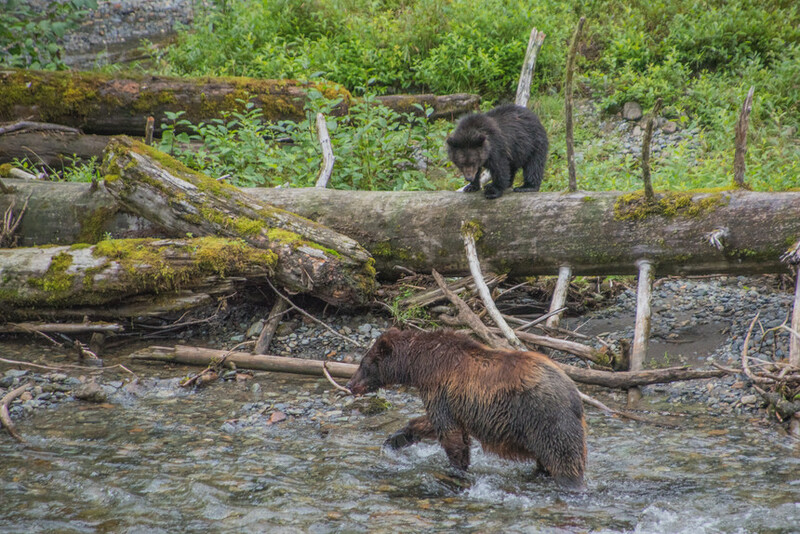 It’s a popular spot for brown bears to lie in wait, catching the salmon for lunch. There is a telescope for general use here, to better see brown bears off in the distance. 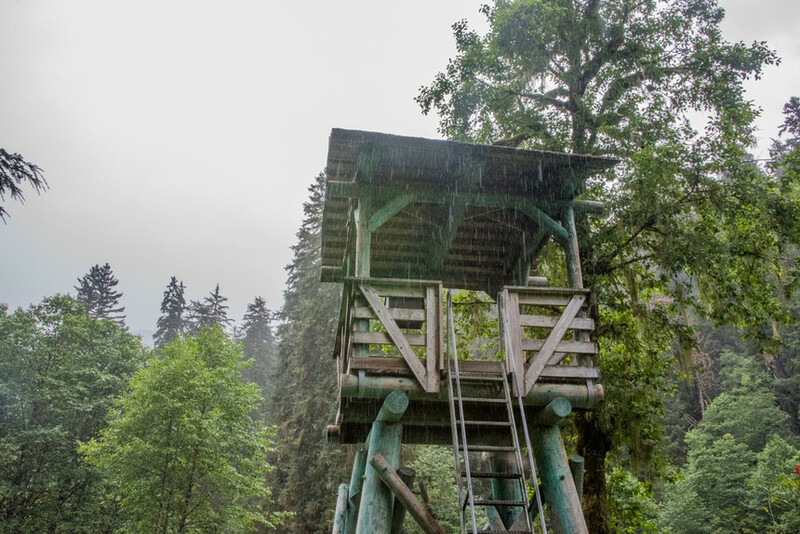 The third viewing area requires a circuitous, mile-long hike through Admiralty’s rainforest to an elevated Observation Deck overlooking Pack Creek upstream. From the Observation Deck (where you are fortunately shielded from the rain), you can see bears hunt salmon in the water below you. All of these areas are strictly managed, because the Forest Service wants the bears to know exactly where to expect people. They are habituated to humans, and don’t want to bother us. 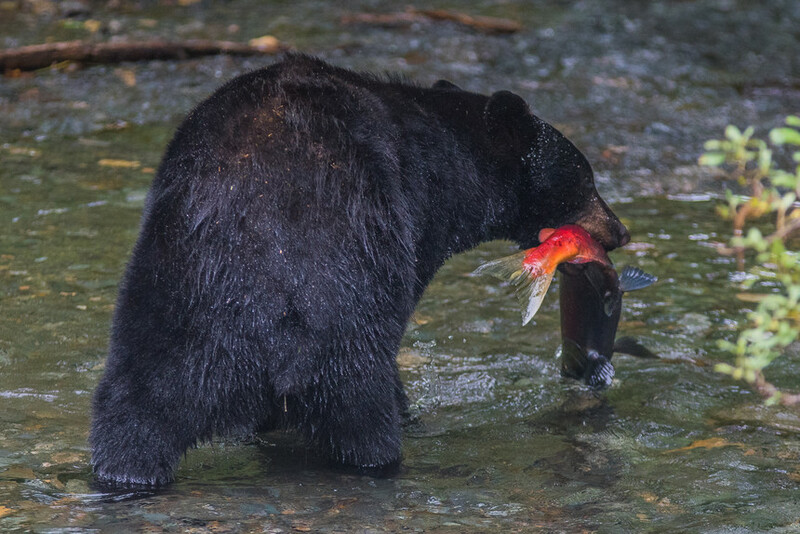 They are interested in salmon, not human flesh, and we’d all prefer to keep it that way: it’s one of the reasons we keep our food locked in underground bear lockers, back near the beach. 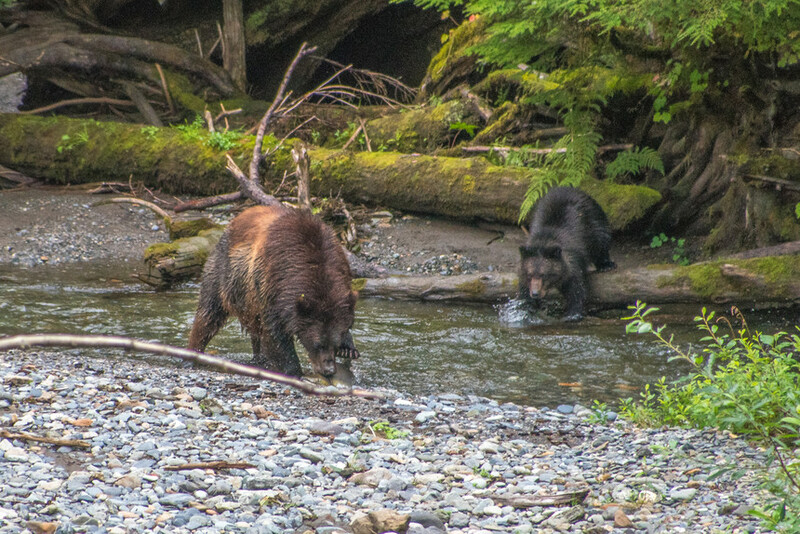 The prime imperative at Pack Creek is to view bears that are truly wild, in their natural habitat, feeding as they would without human interference. The Forest Service only issues twenty-four permits a day to visit Pack Creek, and even then, you must charter your own float plane, or pay upwards of $700 per person to go with a guiding company, who will do little more than provide logistical support, and presumably, a Sherpa who you pay to outrun in the event of an attack. 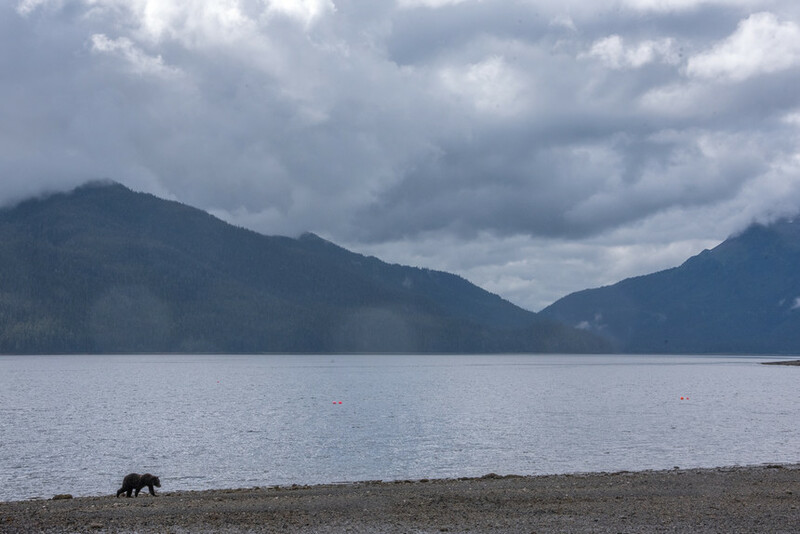 We decide to spend the morning on The South Spit, since it is low tide, and somewhat sunny (for Southeast Alaska). A wonderful time to enjoy the wilderness, and break out the coffee and crossword puzzles, which I knew would come in handy at some point. We can see the silhouettes of bears far off at the water’s edge, lazily looking for food, and we keep a keen eye on them. If we want to see them any closer, we must wait for them to approach us. The South Spit has a single long strip of rocky earth that stretches out perpendicular to the forested shoreline, and this is where we’re camped. Off to one side of the shore, closer to the trees than us, is a mama with her cubs, foraging around for food. The cardinal rule around bears is to not bother them, above all else to not get between them and their food, or a mama and her cubs. A single male makes his way down the coastline, approaching us steadily enough that we deem it necessary to get up from our seats, and take up prime shooting position. Paying us no mind, he crosses in front of our field of vision, though the light is flat that we can only see his silhouette, lit up by the bright grey water behind him. We can see him making his way towards the woods—towards the sow with her cubs. The single male approaches the area where we have our food stored, and we think that he’s going to be like every other wild animal around a roast-beef sandwich—hungry and ready to scavenge my lunch. Yet as he makes his way past the bear bins, towards the forest’s edge, there’s a sudden rustle from the trees., and in an explosion of ferocity and brown fur, our sow comes running full speed out of the trees, directly at the male, who quickly ducks back into the forest, retreating his ground. Those of us standing on the beach exchange awestruck looks…did we really just see a mother defend her cubs from an errant male? Were we able to actually capture this on camera?! …At which point we hear the deafening crack of branches, and not thirty yards from us the single male comes bounding out of the alders, a terrified look on his face. The sow is in hot pursuit, and she soon bursts out of the thicket, right on his tail, running full speed. She is much bigger than her is, a mother charged with defending her cubs against any sort of threat, and she is determined to see him as far away from her young as possible. 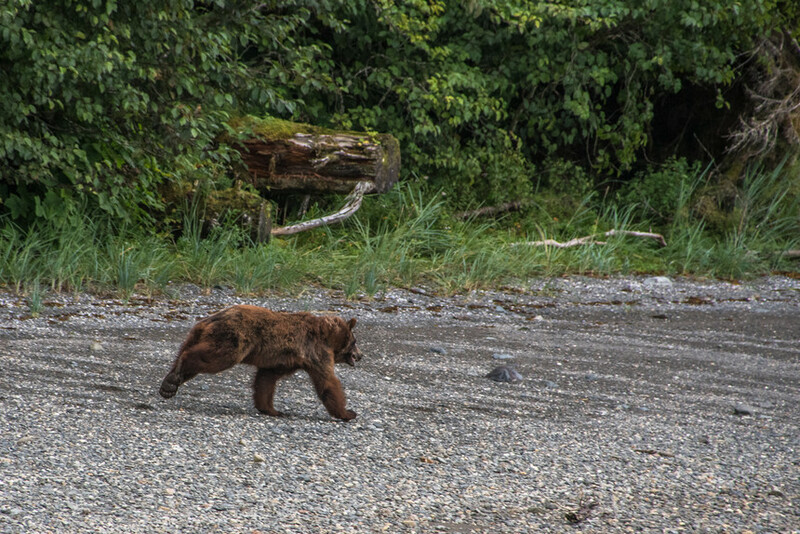 They sprint, full speed, down the beach, towards a guided group hiking to the Viewing Spit, which doesn’t see the bears coming. We want to scream, we want to shout—the ranger wants to radio the guide, but her walkie-talkie is off. Most of all, we want to photograph the look on the face of a terrified Cruise Ship Passenger as it dawns on them that while they might have brought two pairs of socks, they failed to pack an extra pair of Depends Undergarments. The sow chases the male a solid half-mile down the beach before she is satisfied that he is no longer a threat, and begins to return towards her cubs. She now realizes just how far she’s left them behind, and is agitated, eager to return to them. The ranger informs us to be on our guard—the sow will have to pass right by us, and she is worked up. 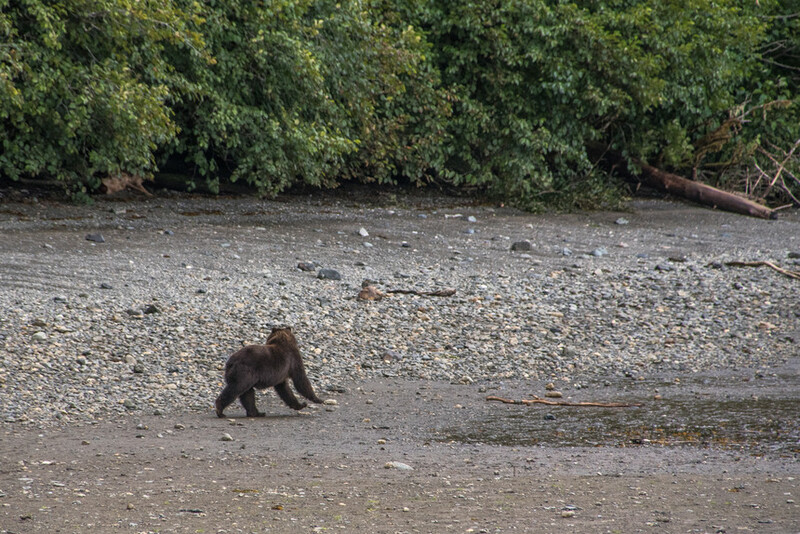 We’re in the unique position of being able to see the sow make her way back towards her cubs, as well as watching her cubs roll around on the coast, oblivious to what just happened, but simultaneously wondering what happened to their mother. She comes to within thirty yards of us, and ducks into the trees at the same spot from which the male emerged. A short minute later, she emerges next to her cubs, and nuzzles them, reassuring them that the threat is gone, and they are safe. They lumber off into the forest, not to be seen again that day. Now, you might recall that at the Mendenhall Glacier visitors center, the mothers take refuge around areas well-trafficked with tourists to keep the aggressive, sub-adult males away. When bears are around humans, they will adapt and use them to their advantage. Yet here, there is no such barrier between a sow’s young and an aggressive, sub-adult male. They are forced to defend them, decisively and viciously. Here at Pack Creek, that’s just what they do. Areas such as this afford the eco-tourist the opportunity to view bears in their natural habitat, but the trade-off is that you never know what you might see. Wild animals are just that—wild, and that means they are unpredictable. It means that you might have to wait an entire day, just to see a bear—the price of your float plane ride be damned. You might pay a pretty penny to find yourself here, but you are not paying anyone else to give you an experience. You are facilitating it yourself. Places like Pack Creek are essential for the well-being of these wild animals. It might seem exhibitionist for the Forest Service to devote resources to the management of bear-viewing, but in today’s Golden Age of Tourism, there is surely someone willing to take a risk to make a buck guiding people to Admiralty. There must be safe areas for humans to have these experiences, otherwise they will be ruined by commercialization. The Native Tlingits had it right: Kootznoowoo does, after all, mean The Fortress of the Bears. I’d like it to remain that way, with only a small window into their lives that we can use to better understand, admire, and appreciate them so that brown bears are here for years to come.